Millions upon millions of photos are taken by the millions of Guests who visit Walt Disney World every year. What better way to memorialize your time in the parks than with pictures that give the visual to the story about your Disney trip that you get to tell when you get home? But true Disney fanatics don’t just take the basic family photos in front of Cinderella Castle—oh, they take those too, but they also know the value in a Disney selfie. How many of these have you taken? Which ones do you take on every visit to the parks? This is the first selfie in the Disney World Selfie family. It’s the iconic picture of you and the family holding up your tickets to the parks. Sometimes there’s a Christmas tree behind you, sometimes there are birthday decorations, and sometimes there’s nothing in the background because you decided to take the family to Disney—just because! This may very well be the most popular selfie on this list. Whether you’ve visited the parks once or 100 times, you no doubt have at least a few selfies in front of Cinderella Castle. After all, it wouldn’t be Disney World without it. Cinderella Castle may serve as the backdrop to more selfies than its sister park’s icon, but Spaceship Earth has done well—EPCOT’s geodesic masterpiece shines brightly in the background of many families’ photos from their visit to Disney’s second theme park. It’s easy to feel ready for the red carpet at Disney’s Hollywood Studios. With all the glitz and glam along Hollywood Boulevard, some people choose to snap their selfies in front of the stage that sits just in front of the Chinese theater. But true Disney buffs know that since we lost our beloved Earful Tower and then Sorcerer Mickey’s hat as park icons, the Hollywood Tower Hotel that houses the Twilight Zone Tower of Terror attraction is the park’s official icon, and many take their selfies along Sunset Boulevard with the creepy hotel in the background. Among park icon selfies, this one wins for most natural surroundings in a selfie. It’s nearly impossible to get a selfie without strangers in the background too when you stop to take a selfie in front of the Tree of Life. Thank goodness it’s a big “tree” and has room for lots of Guests to take selfies at the same time. This is the selfie you take when you’ve secured your spot to see the nighttime spectacular at the park you’re visiting. It often happens while you’re waiting for the show to start. You snap the selfie, post to Facebook and add the comment, “Waiting to see Fantasmic!” And the crowd goes wild (on Facebook anyway). This is the selfie you take on that rare occurrence when you see a celebrity in the parks and you’re lucky enough to catch a selfie with the Hollywood royalty in the background. Or it might be the selfie you take when you visit a new land in the theme parks for the first time—think Toy Story Land on Opening Day. It might even be the selfie you take as a way of congratulating yourself for conquering your coaster concerns and living through a ride on Rock ‘n’ Roller Coaster. You know you’ve taken this selfie anytime you’ve ridden the Monorail with a buddy or your family. After all, it helps to pass the time while you make that long trek from the Transportation and Ticket Center to the gates of Magic Kingdom. This is the selfie you take super fast just after you secure your seat belt or restraint and before your ride vehicle takes off. 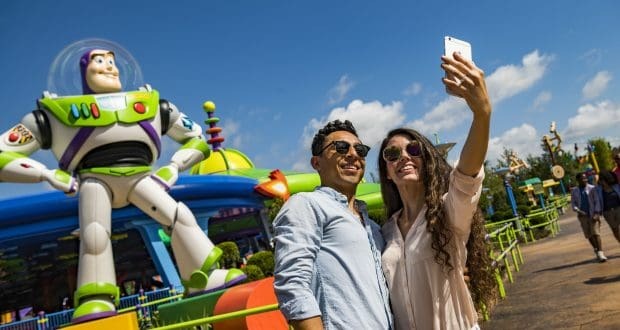 Be careful with this one though—many a phone and/or camera have found a new home on the floor of the attraction because Guests were taking selfies when the ride vehicle took off. Caution: Don’t try this when you strap in at the Rock ‘n’ Roller Coaster attraction. No good will come of it, and you’ll definitely lose that phone. Another self-congratulatory selfie, this one is the selfie you and your ride companion take after tackling a ride you hadn’t enjoyed until now. Coaster scaredy-cats turned coaster junkies are the prime candidates for taking these selfies. These get posted on social media almost instantly with the caption, “I did it!” or the like. You know you’ve done this one, whether you will admit it or not. It’s just one of those Instagrammy things that even those of us who are not so Instagram-savvy do because it’s just a cool idea. It kind of just happens. You’re on Main Street at Magic Kingdom. You stop in at Starbucks and order your grande mocha latte with extra whip and a double shot of caramel (or whatever floats your coffee boat), and because the Starbucks cups at Disney World bare the Disney logos and icons, you’ve just got to snap a selfie in front of the castle so that everyone on Facebook knows what you had to drink that day in front of Cinderella’s grand abode. Yep. You know the type—often these Disney fanatics also happen to be the ones that walk eight wide throughout the parks while on their cell phones. They’re used to doing everything “bigly.” So why not cram as many people into the selfie as possible? This might just be the only sad selfie on the list as it is often taken when we are leaving Magic Kingdom for the day. The train station takes the place of Cinderella Castle in the picture, and somehow our smiles aren’t as glistening as they were in our castle selfie from that morning. Yeah, you know the one—that selfie you take when you realize one of your favorite characters is meeting Guests, but the Cast Member has already closed the line to new Guests coming up to meet said character. And you’re not going down like that, so you take a quick selfie from a distance so that you can still say you got a picture with your favorite character in the background.